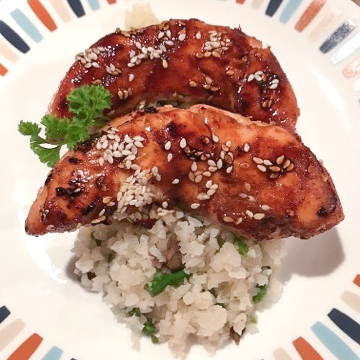 Honey Lemon Barbecue Chicken is an easy tasty meal perfect for family gatherings, or even busy weeknight dinners, any time of the year. The heat of the cayenne warms even on the coldest nights and the sweet sticky chicken fresh off the grill makes the best summer barbecue. Begin preparing your Honey Lemon Barbecue by seasoning chicken lightly with paprika and cayenne pepper. Mix lemon juice and honey and set aside. Place seasoned chicken on broiler rack. Broil 4-5 inches from heat for 15 minutes basting occasionally. Turn pieces over and broil 15 minutes longer, basting occasionally. Combine sesame seeds and 3 tablespoons of honey and lemon mix. Spoon over chicken prior to serving. May be cooked on grill. Lightly salt to taste.